UPDATED, Dec. 21, 2008 Alexander Santos Hernández was released from prison after serving more than 2 years of a 4-year sentence. Delusions cloud the minds of too many people who think about Cuba. There are those overseas deluded by the notion that Raúl Castro is a different kind of dictator. And there are those overseas and in the dictatorship, perhaps Raúl himself, who are deluded enough to believe that a new generation of Cubans, those in their 20s and 30s, might actually buy into the communist comeierda that has enveloped, and polluted, the country for almost 50 years. The story of Alexander Santos Hernández shows how deluded both groups really are. In November 2004, Santos was sentenced to 6 months in prison, on a charge of "disobedience," apparently because of his work on behalf of the Varela Project. He had been arrested in Holguín three months earlier, after a visit from Oswaldo Payá, leader of the pro-democracy effort, according to a Miami Herald story. I first wrote about Santos, who turns 32 on Dec. 5, in May 2006, after he, his wife, the independent journalist Milisa Valle Ricardo, and other dissident couple, were arrested, warned to stop their opposition activities and then released. Apparently, the message didn't stick with Santos, who was again arrested a month later, tried, convicted of being a "social dangerousness," and sentenced to 4 years in prison. Alexander Santos Hernández, national coordinator for the Eastern Democratic Alliance (ADO), resident of the municipality of Gibara, Holguín province, was detained during early hours this morning, tried, and sentenced to four years prison for the supposed crime of “social dangerousness”." “The distinguished activist had accomplished remarkable and meritorious work over the years in hopes for freedom and democracy, motive for which he had already come to well know Castro’s unjust gulag. Alexander Santos Hernández is an example for Cuba’s future generations who seek a future full of peace and hope,” declared Eliécer Consuegra Rivas. The Castros long ago lost Cuba's youth. Many of them, like Santos, are not deluded by the dictatorship's slogans. The revolution, whether lead by Fidel or Raúl, has brought them nothing but poverty and repression, which is why so many either have left the country or joined the democratic opposition. Raúl Castro is no less a dictator than his brother, and anyone who looks past the PR would see that. Dissidents like Santos and his wife, are harassed, threatened and jailed, whatever it takes to silence them. Actually, Santos was jailed while Fidel was still in control, but Raúl has made no effort to empty the gulag. More than a year after taking interim power, Raúl has demonstrated that anyone who thinks he is a democrat in tyrant's clothing, is truly delusional. Alexander Santos Hernández, and the hundreds of other prisoners of conscience in Cuba, are proof of that. One of the surest indicators of the repressive nature of the Castro regime is the jailing of political prisoners. To illustrate that reality, Uncommon Sense each week profiles one prisoner. There also is a Political Prisoner archive on the right sidebar. To suggest a prisoner for a profile, send me an e-mail. 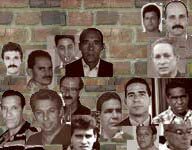 For profiles of imprisoned Cuban journalists and related information, read the March 18 Project.